Pioneers in the industry, we offer milk tank cleaning brush, water bottle cleaning brush and machine brushes from India. Facilitated with technically advanced processes at our ultra-modern manufacturing unit, we are able to provide Milk Tank Cleaning Brush. 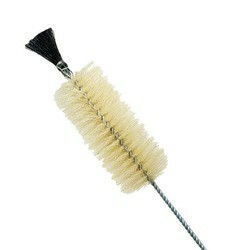 Our Milk Tank Cleaning Brush is accessible in various sizes & customized options so as to satisfy needs of our customers. The brush offered by us is provided in finest packing for ensuring defect free transit. Our range is manufactured from the excellent quality of material & latest techniques keeping in mind the set standards of the industry. Being a reliable entity, we are instrumental in supplying a large assortment of Water Bottle Cleaning Brush. Our offered brush is manufactured using the finest quality basic material and pioneered technology at our well-equipped manufacturing unit. Offered brush is used for cleaning water bottle and appreciated for its optimum quality. 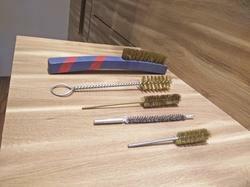 Further, this brush is checked by our quality experts before the time of delivery. Size: 6*3, medium hard square brush. Differnt type of Gemeral Cleaning bruhses available.